Here is a selection of excellent books for learning calligraphy. All of them are inexpensive and can be shipped to you quickly. If you would like to see how you can purchase books from my list, simply click the "Show Me More!" button. By special arrangement, you can shop on-line securely at Amazon.com. Calligraphy For Dummies by Jim Bennett (that's me!) covers everything you need to know about pens, inks, materials, and how to use them. It shows you in detail how to do all the basic alphabets (including Copperlate, which is not included in other basic texts). It also shows you how to do a number of calligraphy projects from addressing an envelope to lettering a quotation to designing a poster. This book which I wrote and illustrated, is a complete calligraphy course. I recommend it to all my students from beginning to more adavanced. I believe my book is the most comprehensive book on calligraphy in print today! Learning Calligraphy by Margaret Shepherd is really a beginner's textbook. It covers most of the basics. This book is a lot of fun and I recommend it for anyone who is just beginning. The Art of Calligraphy by David Harris. This beautifully designed book is the most thorough work on calligraphy I've ever seen. Shows alphabets, techniques, history, and projects. The photos showing how-to are the best. If you're going to get just one book, make it this one! The Italic Way to Beautiful Handwriting by Fred Eager. This is a workbook which teaches the Italic alphabet from basic forms all the way through embellishments. Excellent! I highly recommend this one for everybody! Using Calligraphy by Margaret Shepherd. This book is a continuation of "Learning Calligraphy." It is a beginner's book which shows how to do a variety of projects. If you like Margaret's Shepherd's approach, you will enjoy this book a whole lot. Lettering Tips by Bill Gray. Written by a commercial artist, this book is full of great tips for commercial lettering. Left-Handed Calligraphy by Vance Studley. Absolutely the best book on this subject available! Some great alphabets too! Writing & Illuminating& Lettering by Edward Johnston. This is "the" classic reference book written by the "father of modern calligraphy." 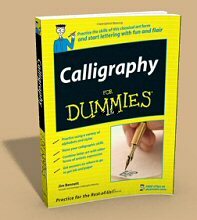 A "must" for any serious calligrapher. Calligraphy for the Beginner by Tom Gourdie. The title says it all. This is a no-frills, how-to book on essental calligraphic alphabets. Pen Lettering by Ann Camp. This is one of my personal favorites. It is for beginners and is easy to understand. The alphabets are excellent. Calligraphy Tips by Bill Gray. A commercial artist's approach to calligraphy. This is really an extremely helpful book that is just full of tricks and tips. I love it! Calligraphy: From Beginner to Expert (An Usborne kit - comes with 3 pens) The title is misleading; it is really an easy book for beginners, and it is not too bad. This kit offers a quick and cheap way for a beginner to get started. For that reason, I include it on my list. Calligraphy Projects (Another Usborne book) This book has 14 easy projects from embossing notepaper to T-shirts. It is an inexpensive and fun book which will help the beginner or the young person to find ways to use calligraphy.